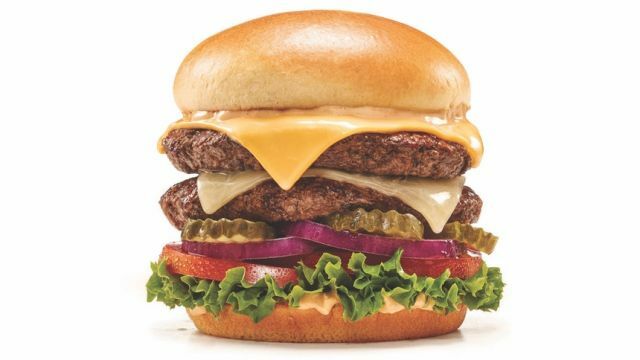 IHOP is temporarily marketing themselves as IHOb to push the debut of the chain's new Ultimate Steakburgers. The "b" is for "burger" and is lowercase because that's what you get when you flip the "P" in IHOP upside down. - Big Brunch - Custom-cured hickory-smoked bacon, a fried egg, a crispy browned potato (basically hash browns), American cheese, and new signature burger sauce to go with the Black Angus beef patty and a buttered and grilled brioche bun. - Cowboy BBQ - A Black Angus beef patty, two crispy-fried onion rings, custom-cured hickory-smoked bacon, American cheese, lettuce, tomato, and tangy BBQ sauce on a buttered and grilled brioche bun. - Jalapeno Kick - A Black Angus beef patty, a spicy blend of sauteed jalapenos, Serrano peppers, and onion, custom-cured hickory-smoked bacon, pepper jack cheese, lettuce, tomato, and jalapeno mayo on a buttered and grilled brioche bun. - Mushroom & Swiss - A Black Angus beef patty, sauteed mushrooms and onions, Swiss cheese, and mayo on a buttered and grilled brioche bun. - The Classic - A Black Angus beef patty, American cheese, lettuce, tomato, red onion, pickles, and signature burger sauce on a buttered and grilled brioche bun. 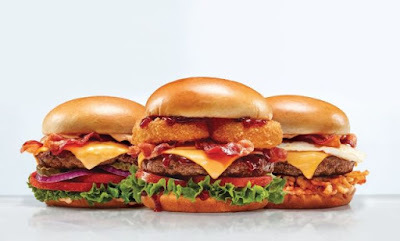 - The Classic with Bacon - It's the same as the classic but with hickory-smoked bacon. - Mega Monster - Two Black Angus beef patties, American and White Cheddar cheeses, lettuce, tomato, red onion, pickles, and signature burger sauce on a buttered and grilled brioche bun. 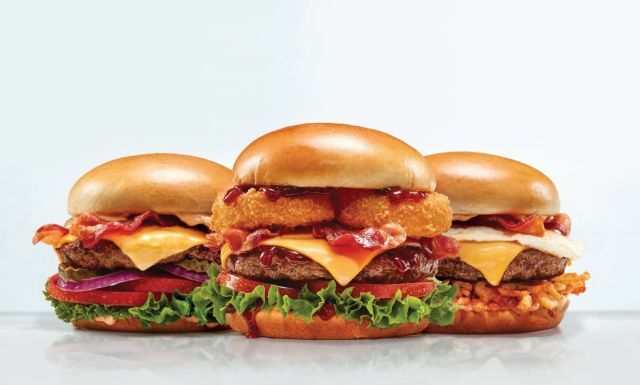 The new Ultimate Steakburgers can be found at IHOP restaurants nationwide and, for a limited time, come with unlimited fries and a drink starting at $6.99 at participating locations. Because pancakes aren't out of the picture or anything, the chain is also offering new Vanilla Spice Pancakes for a limited time. The dish features a stack of buttermilk pancakes topped with spiced vanilla mousse. The mousse is spiced with cinnamon, clove, ginger, and cardamom.